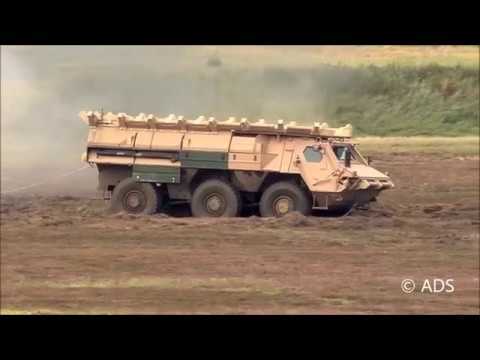 The Rheinmetall Active Defence System (ADS) for light to heavy vehicles combines performance and innovation. ADS is able to counteract various attacks thanks to the optimal interaction between individual high-tech components. Threats are detected, assessed and intercepted in the immediate vicinity of the vehicle before they reach their target. The solution for 360° protection. Various test scenarios: 1. ADS on a test rig within a firing range defeating an anti-tank guided missile (ATGM). The warhead does not ignite and the ATGM is destroyed before the impact. Sensors are not influenced by objects nearby. 2. ADS and Rheinmetall’s ROSY (Rapid Obscuring System) installed on a test rig in a desert like environment. Before the RPG is fired, ROSY produces n instantaneous, large-area, multispectral interruption of the line of sight. 3. ADS on TPz Fuchs with multiple RPG shots, shown in different perspectives. 4. Rheinmetall Defence systems installed on an armored truck cabin: ADS hard-kill system defends against ATR/ATGM, ROSY breaks the line of sight and the weapon station is then directed into the bearing of the threat. Judging by what is shown at ~0:30 and onwards, this APS system is functionally similar to Ukrainian "Zaslon" APS (https://www.youtube.com/watch?v=LAoeWw51l3U), which is in itself a modernized version of 80s Soviet APS called "Barrier" (which is an improvement upon the much earlier "Dozhd" APS). The main difference seems to be that there are more HEFRAG packages around the vehicle, and that they appear to be firing downward instead of being omnidirectional. There are already so many different types of APS' out there on the market. But still expensive and kinda new technology. Let's see in 5 years time. For now, I think most still think light weight add on armour, reactive armour and slat armour. One of the big advantages seems to be the short reaction time of the system. Old APS were probably built around a scenario were there is a bigger distance between the attacker and the attacked vehicle. The Rheinmetall version seems to be working even if there are just a couple of meters between the attacker and the vehicle. Fascinating stuff!